Is there a real Queens? Improving human life. In planning this column, I wondered how I might introduce a place far away most of you have never visited. Then I remembered that network TV (CBS) runs a show I'd never seen called The King of Queens. As it is a popular, long-running series, I'll make the assumption many of you have seen it - even if I still have not! Ok, I confess. This whole build up is so that you will take the time to read an online article in City Journal about the public library system operating throughout the borough of Queens called: A Social-Uplift Program That Works. The article's subtitle is: The Queens Library’s secret: help those who help themselves. It explains how, despite painful financial setbacks, the library is the setting for all sorts of wonderful things that really help people get ahead in life. Take it as inspiration for some of the things we might try to do at our library in the years to come. Of course, the fact that Queens is in the heart of a big city and we are not makes for some important differences between its libraries and ours. Obviously, when the library is not within walking distance for all of its patrons - especially the kids - some things are impossible. But we should take that not as a discouragement, but as a challenge to our imagination. Perhaps no part of our world as the countryside has as much potential to benefit from modern digital telecommunications. That's because it lets people work and socialize together, even if it is too expensive or time-consuming to actually travel to meet. Personally, I think one criticalown equipment at the places they spend nearly all of their time. A small begining in this effort is the section of our Web site we devote to "free high-tech tools and services"
(+) Here are some other amusing TV coincidences for you to ponder. The Honeymooners took place in a Brooklyn neighborhood called Bensonhurst, later the setting of the mythical James Buchanan High School in TV's Welcome Back, Kotter. (Surely you've heard the name Buchanan?) What's more, it turns out King of Queens co-star Leah Remini grew up not in Queens - but in Bensonhurst. And her first TV role was as the daughter of the wisecracking Cheers barmaid portrayed by Rhea Perlman, yet another Bensonhurst girl. Can computers and the Internet be cheap and easy to use? A non-profit MIT spin-off called One Laptop Per Child, financed with venture capital from a group of high tech, media, and other firms (including Google, eBay and Newscorp) has now developed the general-purpose laptop computer you see in the images above. Ruggedized for use by schoolchildren in developing countries, the machine, which has no internal moving parts, can be reconfigured as shown. Power-stingy and running on rechargable batteries, it consumes no more than 2 watts - and a mere 1/10 watt when used as an electronic book in daylight. The laptop hardwarebuilds in a video camera and digital radio networking, and can accept USB and memory-card plugins. It will be sold with bundled software to educational ministries in lots of one million for a mere $150 per machine FOB - with prices to fall dramatically in years to come. The projected life span of the device is approximately five years in harsh places where power grids are unknown and roads are unpaved. 2006-12-16"President Tabaré Vázquez officially announced his and the country's intention to enter into OLPC and to provide every child in Uruguay with a laptop within two years..."
It remains to be seen whether the cost of supporting the machines will prove as economical as buying them - and whether learning to use them and integrate them into the educational establishment will prove easy - or at least doable. But the existence of these machines makes it obvious that the cost of hardware and software is hardly a limitation for widespread deployment of laptop computers in wealthy nations like the United States. OECD numbers from 2003 shows that the US spends an average of $8305 per child annually for primary education. For a year with 180 instruction days, that's over $46 per day. At that rate, how many lost days does it take to buy each child a laptop computer? And how many days per year is that if the machine lasts five years? OECD's Education at a Glance 2006 Chart D5.1 (using the PISA 2003 database Table D5.1) shows that in the US, there is about one school computer for every three students - admittedly the highest deployment rate among all the nations compared. But when computers are so cheap, why doesn't every student have a personal laptop computer he can use 24/7? When every machine is identical, any software reconfiguration which is ever required can be worked out for one machine - and then all but automatically replicated for every last machine in a peer group. When textbooks are licensed in digital form and a reading machine is available, the cost to manufacture another book copy is close to zero - compared to the $2 it costs to make a typical paperback book (aside from the expense of transporting and storing this bulky traditional form of recording information). And when electronic communications networks are available, the remote creation of book copies can be automated. When books are so cheap ("free") to make, one need never wait to revise them when editorial costs can be paid, to avoid wasting a sunk cost of inventory. An important part of the OLPC project will be repurposing and creating educational materials to be delivered in electronic form. A highly efficient scheme to encode scanned materials will be available so that legacy paper-based materials can be easily exploited in digital form. Even a "lower-middle income" country like China spends $18 a year per student on paper-based textbooks - $90 over the projected lifetime of an OLPC computer. 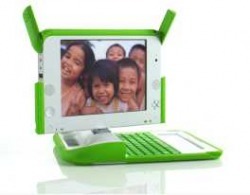 The ability to act as a universal textbook goes a long way to justify the cost of OLPC machine - even without considering that it is a powerful modern computer stuffed with gadgets. Indeed, an electronic device like a laptop computer is more than a silent book. It is perfectly capable of instructing the preliterate - and illiterate - through means like audio-annotated slide shows or even limited amounts of video. Even the simplest implications offer advantages. People can easily learn to type much faster than they can write by hand - and with the advantage of perfect legibility in the bargain. Why learn to craft letters by hand when there is universal day-long access to electronic typing? Think of how the time spared can be put to better use. Maybe we need a tax credit for the poorest Americans to buy a laptop... Now, maybe that's wrong. Maybe it's expensive. Maybe we can't do it. But I'll tell you, any signal we can send to the poorest Americans that says, 'We're going into a 21st century, third wave information age, and so are you, and we want to carry you with us,' begins to change the game. Well folks, the gear isn't expensive anymore. When will we find the will and wisdom to integrate the technologies that play so vital a role in all modern business into the lives of every last normal child who will see the latter years of this new century before his active days are over? Sadly, places in America like Cobb County think it is more important to hold legal debates about financing methods. But it would seem Libya and Uruguay have other priorities concerning the future. If you'd like to learn more about this, there is a book just published by the 85,000-member International Society for Technology in Education (ISTE) called 1-to-1 Learning: Laptop Programs that Work. Parts of the book are available online for free: the table of contents and an entire sample chapter. If you prefer listening to reading, there is a 47-minute discussion with the book's author online for free as well. Just download this 21 megabyte MP3 file and listen to it with your portable digital audio player, PDA or laptop computer. Alternately, listen at once, via your streaming media player (e.g. RealPlayer), sitting at your desktop computer. We hope this software will also help patrons watch DVD movie disks created by friends and family, by letting them do new things with them. This new software only cost a few dollars and installation only took a few minutes. Nonetheless, we are grateful to all of our Friends and volunteers who help make small advances like this possible. As reported in the October 2006 newsletter, the old north vault in the Historic Courthouse which houses the library was being remodeled into a new room for the library, to provide shelf space for an inventory of adult fiction books. Well, guess what? The remodeling work is now complete. Wonderful new steel shelving now populates the room. And better yet, every week, additional books are added to populate these shelves. In addition, the eastern wall in the main reading room now also boasts similar new wall-attached shelving, replacing now-removed short, floor-standing shelves which were oriented perpendicular to the wall. So the eastern end of the reading room now also enjoys a great deal more open floor space, potentiating the creative use of same. We hope you will have an opportunity to visit the library soon and check out the new sights. In closing, we wish you and those you love a wonderful holiday season and the best of everything in the new year to come.